Monday brings an opportunity to practice flower arranging by joining in Cathy’s weekly challenge In A Vase On Monday to fill a vase using materials gathered from one’s garden. The flowers open in the garden this week are daffodils, crocus and hellebores, so for this Monday’s offering I chose a bouquet of miniature daffodils, placed in a small matte-glazed, blue ceramic vase. Considered an early bloomer, Narcissus ‘Tete-a-Tete’ began opening March 9. Perhaps because winter seemed so cold and endless I thought they were a little late opening in pbmGarden. Other gardeners have been highlighting theirs for a few weeks, but memory is tricky. Actually mine opened two days earlier than last year. 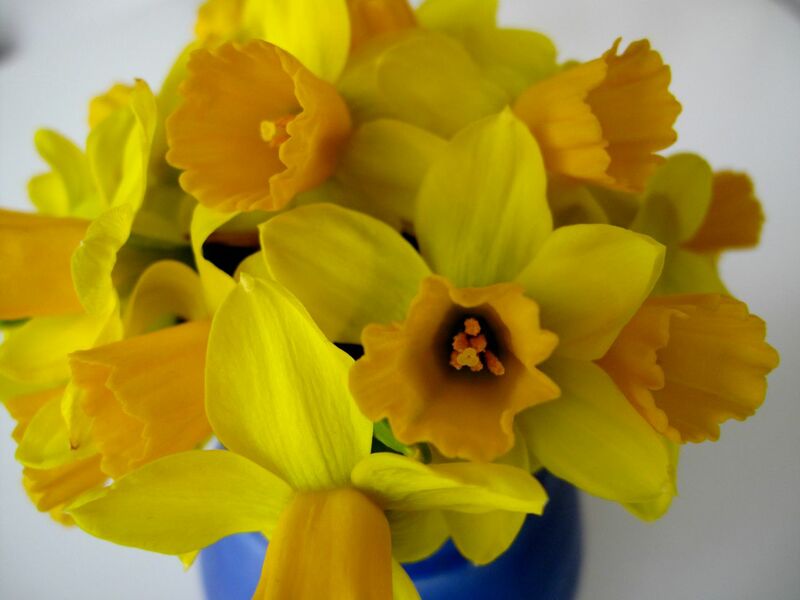 Growing only 6-8 inches tall, these cheerful little daffodils have caused a shift in the mood of the garden and the gardener. What a difference some warm days and little patches of yellow can make. The buttercup yellow flowers feature narrow, long trumpets. The stems hold 1-3 flowers per stem, though only a few of the ones I checked this morning had three blooms growing head-to-head. The others were singles. This entry was posted in garden and tagged flower arranging, flower design, garden photography, in a vase on monday, Narcissus 'Tete-a-Tete', nature photography on March 16, 2015 by pbmgarden. 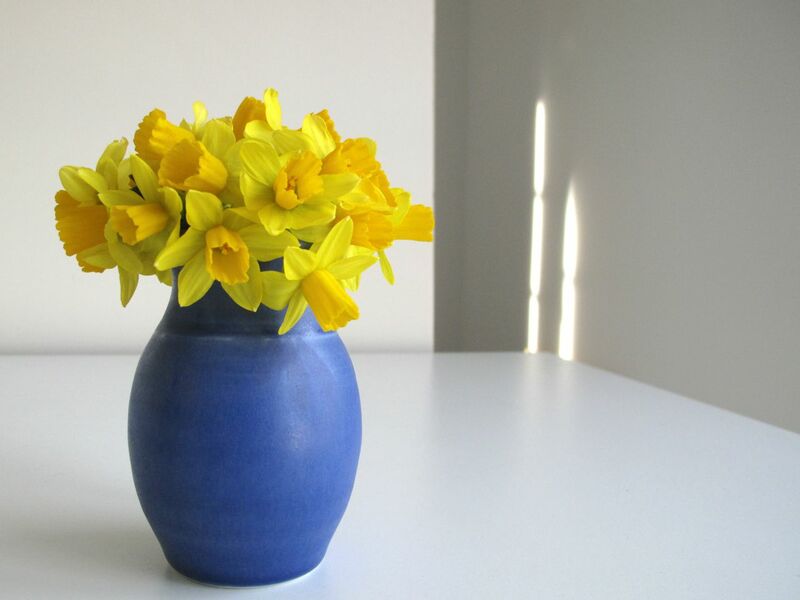 I love the cobalt blue of that vase Susie…and the yellow daffs are a perfect flower for it….now if we could get spring a bit nearer here…. I reach for that blue vase over and over because of its strong blue hue. Seems to go with everything. Yes, spring is almost here! My daffodils will open these days, too. Lovely vase, blue and yellow are always a great combination of colours. Thanks for sharing! Thanks Anca. Hope you get to see your daffodils soon. As you have already read, these are my favourite flowers of spring. I like the abundance of your vase very much, mine was a little thin! A lovely blue vase too – great minds think alike! Thanks. Yes, a blue vase was definitely called for today! Since planting them for Spring 2013, Tete-a-Tete has been multiplying very well, so I didn’t mind bringing in a good handful. What a lovely cheerful vase Susie. Your little daffodils are a little ahead of mine, so it’s nice to see some bright yellow! Thanks Cathy. Daffodils are springing up all over town this week. Such a wonderful bit of joyful color to brighten a Monday afternoon. Thanks Charlie. Monday can always use a bit of color. I see daffodils are making everyone cheerful this week. Love your iris too. It’s 80F today before dropping back down tomorrow. Spring is trying very hard and I’ve enjoyed seeing daffodils pop up everywhere this week. Stunning! 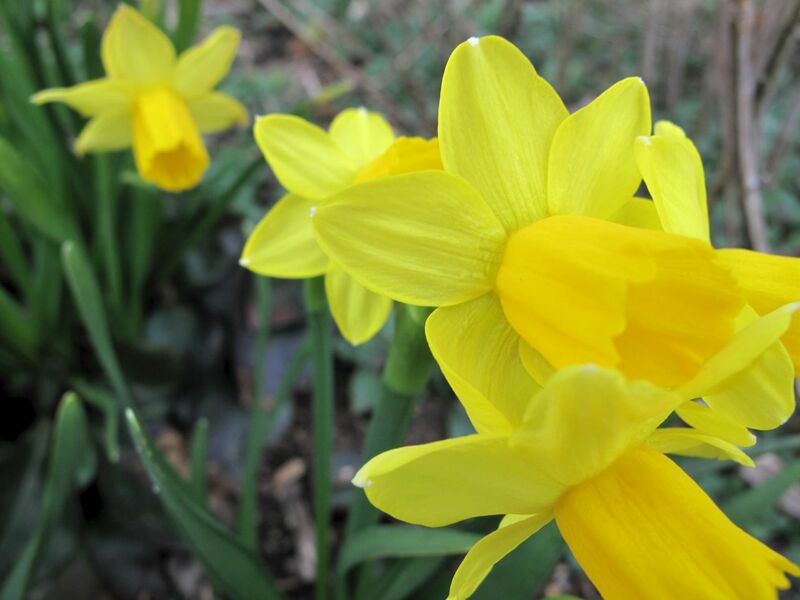 Nothing says spring like a daffodil. Thanks Marian. Daffodils do indeed say spring. Every home around here, large or small, seems to have a welcoming cluster of them. I’m glad spring has made an appearance, Susie. 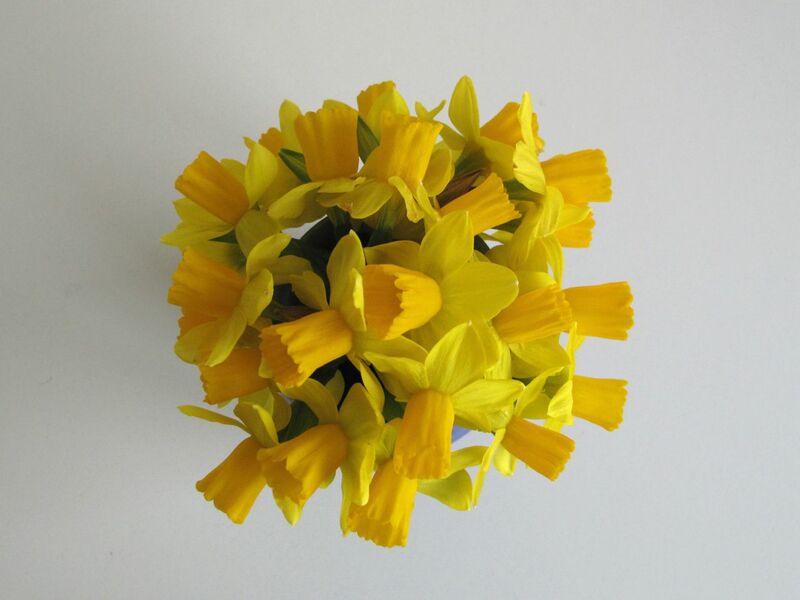 The daffodils are the very definition of cheer. Thanks Kris, seeing the daffodils this week has lifted off heavy weight of winter. Everyone’s smiling. Aren’t they wonderful!!!! Your blue vase is perfect. Thanks WG. 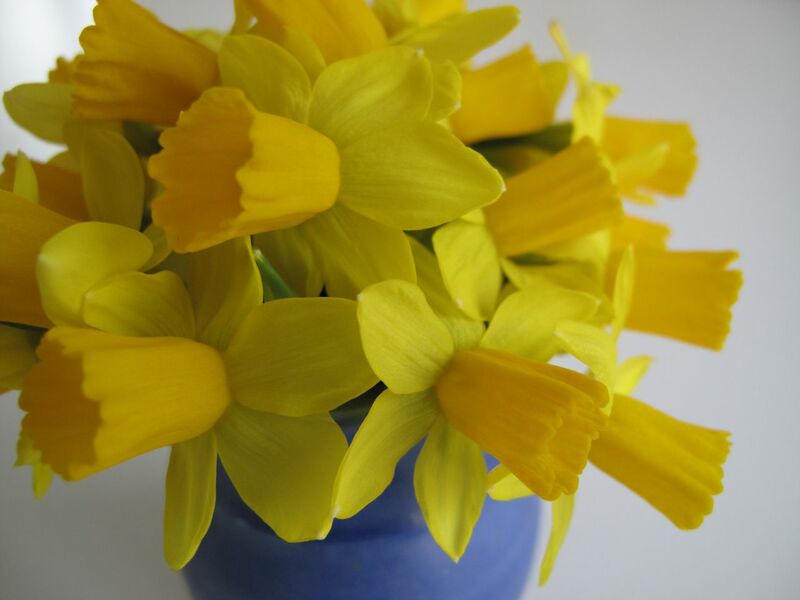 You’re right–it’s been fun to see the bright daffodils indoors (and out) this week. Thanks Judy. They have been so cheery this week. Nothing can say ‘Spring’ like Daffodils. I love the contrast of the flowers and the vase.